Get to know John better by viewing video interviews, listening to podcasts,and reading blog posts and articles. You can also learn more about the many books he has authored or co-authored. John speaks about the importance of nonverbal behaviors in international and global negotiations. A video briefing on the work of the UCI Center for Citizen Peacebuilding. John was a founding Director in 2001. John provides a bit more detail about the UCI Center for Citizen Peacebuilding in his 2005 introduction of Shirin Ebadi, Nobel Peace Prize winner from Iran. A Good Russian: John presents an award to Mikhail Gorbachev at UCI in 2004. Gorbachev managed a peaceful dissolution of the USSR, and he saved more lives in the 20th century than any other person. John's sister is interviewed by ABC News about the book she co-wrote with John about multigenerational living. This segment mentions the first edition of the book, Together Again; the current edition is titled All in the Family. Blog Post 05/28/18: The Upcoming Trump/Kim Summit in Singapore, if It Happens? Blog Post 09/15/17: Contrary to Trump’s Rhetoric, Immigration Is Crucial for the U.S.
Blog Post 09/15/17: A Nobel Peace Prize for President Trump? 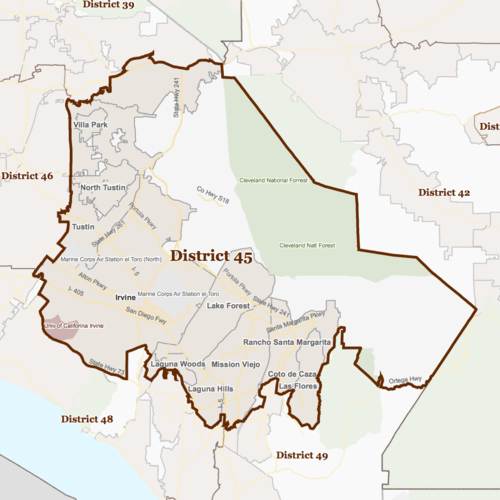 California’s 45th Congressional District includes Irvine, Tustin, North Tustin, Villa Park, Laguna Hills, Laguna Woods, Lake Forest, Rancho Santa Margarita, Mission Viejo, the Canyons, and parts of Anaheim Hills, Coto de Caza, and Orange.